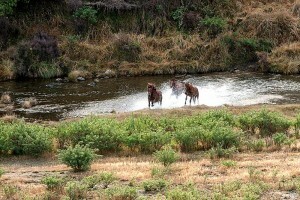 They are still alive: the Wild Horses in the north of New Zealand. In the Kaimanawa ranges they found a place to live. However, they are not totally free but controlled by the Department of Conversation (DoC). 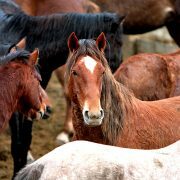 They regulate the size of the herd population and due to a limited habitat every year many horses end up at the slaughter. 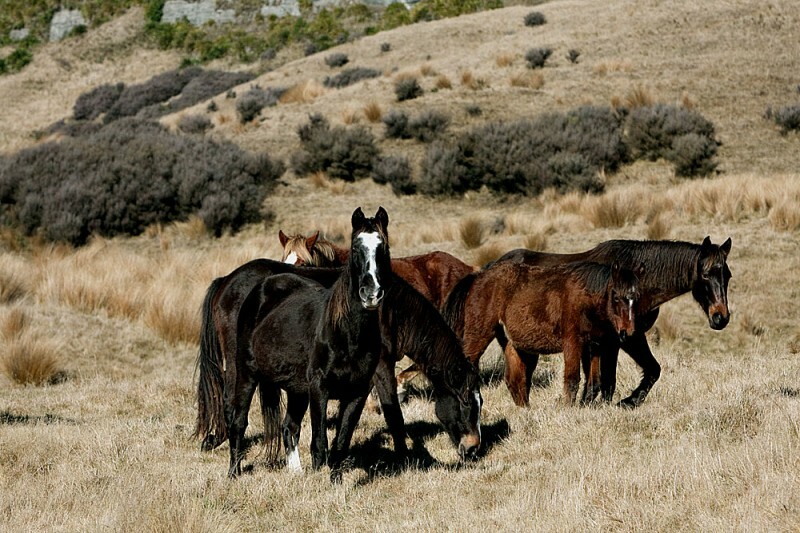 Today there are about 300 Kaimanawa Wild Horses which live in the Kaimanawa range in the north of New Zealand. Once a year all horses are mustered and counted and nearly 140 horses get sorted out of the herd. 30-50% of these horses end up at the slaughter- a terrible number! Since the 1990 s the wild horses are managed by the Department of Conversation (DoC). 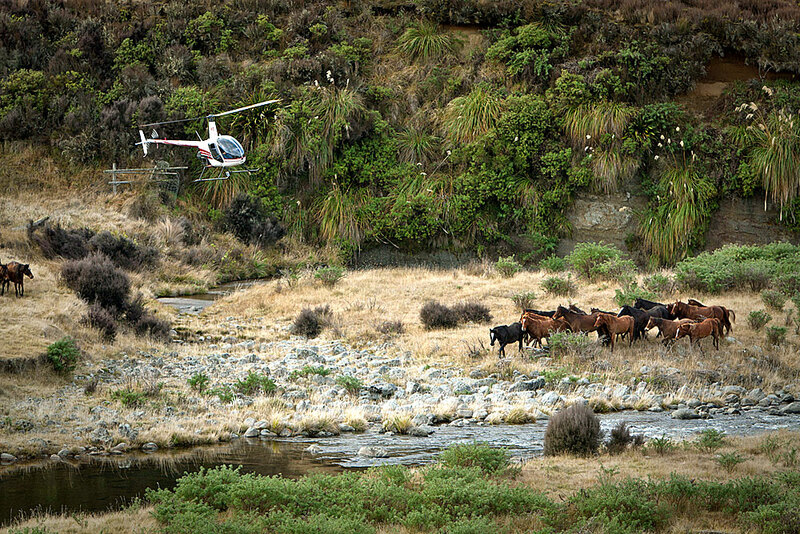 To save the unique nature of the Kaimanawa ranges and to offer enough fodder for every horse the size of the herd is limited. In 2003 a group of horse lovers came together to stop the slaughtering. They founded the “Kaimanawa Heritage Horse” (KHH) Trust which tries to find new owners for the rejected wild horses. Until now the trust could already save the life of more than 600 wild horses. Generally every interested prospect has the possibility to buy a Kaimanawa Wild Horse. In 1814 the first horses arrived in New Zealand. In the following decades these ancestors were crossed with several other horse breeds. Between 1858 and 1875 the horses were crossed with Exmoor Ponies which were brought to New Zealand by George Gwavas Carylon. The result was the so named Carylon Pony which was a small and really robust pony. In the following years two Welsh stallions were crossed with the Carylon Pony. Due to the name of one of the stallions (“Comet”) all horses which resulted from this crossing were named “Comet” breed. In 1870 one Comet stallion and several Comet mares were released into the Kaimanawa range by Sir Donald Mc Lean. This was the birth of the wild horses in New Zealand and from that time on they could reproduce naturally. From time to time horses from other farms were set free or escaped out of the stables and influenced the breed. Due to this also Arabian horses were crossed with the wild horses. The result of all these crossings is the Kaimanawa Wild Horse of today. It is much higher and stronger than the former Comet breed. The outward appearance of the Kaimanawa Wild Horse offers a great variety because any colors are permitted. All horses have a strong musculature and a height between 12.2hh to 15 hh. Due to a short and very muscular neck some bodies appear a bit bulky. However, the head is characterized by expressive eyes and a wide forehead. The legs are long and the hooves are small and robust. Some horses are really elegant and impulsive so that you can easily see the influence of the Arabian breed. In combination with the strong musculature the Kaimanawa Wild Horse has a really harmonious outward appearance what makes them so unique and distinctive. A New Zealand Wild Horses is characterized by its curiosity. It is interested in everything and you can easily make them enthusiastic about new exercises. Due to their high intelligence and their ability for fast understanding they can quickly challenge them. Additional features are robustness, power and balance. The horses are friendly and in a new situation they stay calm instead of falling into panic. Once a year the Department of Conversation organizes a herd count. 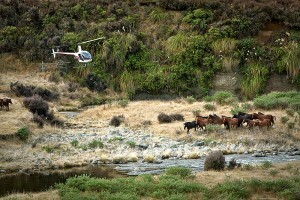 With the help of helicopters and GPS they detect the local positions of the horses and drive them into the Waiouru Yards. There they get counted and checked. All procedures are controlled by a vet and in general all workers pay a high attention to the welfare of all horses. The Musters are not public because this would disturb the work with the horses. The Kaimanawa ranges offer a habitat for 300 horses. A higher number would destroy the unique nature of the area and additionally there would not be enough fodder for every individual horse. 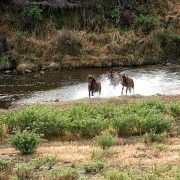 The wild horses have a great natural reproduction and every year nearly 140 horses need to be separated from the herd. If the KHH cannot find a new home for the rejected horses they end up at the slaughter. 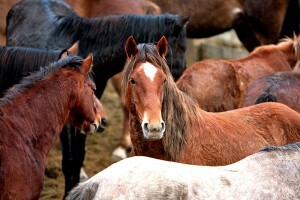 Therefore the work of the KHH has a great importance and until today they could save the life of more than 600 horses. Thanks to the KHH every year many horses do not end up at the slaughter. Nevertheless there still is a high number of horses which grow up for the slaughter- terrible facts which quickly need to be changed! Due to the limited habitat the herd size cannot count more than 300 horses. Therefore the Department of Conversation and the KHH is searching for alternative solutions. One possible solution is the “Immunocontraception”. The idea: the origin of a too big herd size is the rapid reproduction. If you try to limit this reproduction you can control the number of new born foals and no foal is born for the slaughter anymore. Therefore every born animal has the chance to grow up and live in the Kaimanawa ranges. Out of an economic point of view this makes sense. However, the Immunocontraception is discussed a lot because some people judge it as a massive intervention into the autonomy of the wild horses. For the Immunocontraception you use the vaccine GonaCon. This contains the hormone GnRH which you can find in every natural hormone system of a mammal. In the vaccine the hormone is combined with a protein and a further adjuvant. This combination reduces the number of the hormones which are responsible for the reproduction and therefore the fertility gets limited. Compared to other vaccines GonaCon has great advantages. After the inoculation the wild horses do not change their natural behavior and there are no significant side effects of the drug. However, there needs to be further scientific research about the vaccine GonaCon. Until now an inoculation provides a contraception for a limited time. After some years the horses have their normal fertility again and the prevention cannot be upgraded with a further vaccination. Referring to this there is a long-term study about the GonaCon vaccine in the USA. Dan Baker (Colorado State University) is the head of the study. Over a period of eight years he tests the vaccine with domestic horses and wild horses from the Theodore Roosevelt National Park in North Dakota. The study provides a chance for a significant improvement of the vaccine and therefore a long-term contraception for horses. The KHH hopes that with the help of this drug they can regulate the herd size without any slaughtering. For the future they plan that also Kaimanawa Wild Horses participate at the long-term study. Undoubtedly the use of contraception for wild horses is not without great controversy. On the one hand this is a massive intervention into the autonomy of the wild horses. On the other hand it represents a possibility to regulate the size of the wild horse herd without any slaughtering. In this case all horses which are born will have a place to live for sure. A vaccination of some mares would reduce administration and especially avoid the annual musters. This also means a protection of the habitat and therefore a protection for the horses for which there is enough space and fodder. According to this the vaccine does not only mean a prevention of the reproduction of the wild horses but also a preservation of the current population. If you want to support the long-term study of the vaccine GonaCon with a donation, please click here. Wild horses all over the world are a symbol for autonomy and freedom. In New Zealand they remind of the pioneers which conquered new land and started a new life. 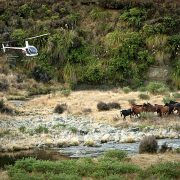 The “Kaimanawa Heritage Horse” (KHH) Trust clarifies that the wild horses stand for this national heritage and therefore it is the important mission to save and keep this part of the New Zealand history. Since 2003 the members of the Trust try to save the wild horses from the slaughter and found new owners and homes for them. Additionally it controls the breed register. 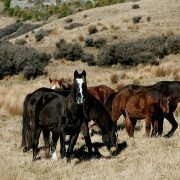 The focus of the Trust is the welfare of the Kaimanawa Horse, so that they take care of wild horses and assist owners of domestic Kaimanawa horses. Every year the Trust organizes several events for Kaimanawa owners and friends. Here they can talk about their individual experience and take benefit from each other. Some of these events are the Casual ribbon days, the National Show and the Range Trips. The KHH is a Trust and therefore dependent on any donations of Kaimanawa friends or horse lovers. If you are interested in the purchase of a Kaimanwa wild horse or if you want to have more information about the KHH Trust, please click here. All information are taken from the webpage of the Kaimanawa Heritage Horse Trust.